INGREDIENTS:Optimal Biological Value Whey Protein Matrix (Whey Protein Concentrate, Whey Protein Isolate), Cocoa Processed with Alkali, Xanthan Gum. Natural and Artificial Flavor, Soy and/or Sunflower Lecithin, Salt, Sucralose, Acesulfame Potassium. Depending on your individual protein needs, mix 1-3 scoops of Machine Whey into 6-18 ounces of cold water or milk (6oz per scoop) in a shaker or blender. 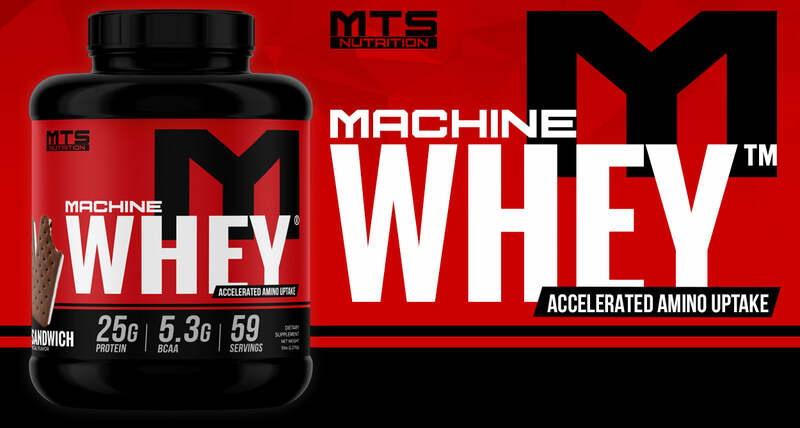 For maximum results, consume Machine Whey pre and post workout and anytime you need extra protein in your diet. INGREDIENTS:Optimal Biological Value Whey Protein Matrix (Whey Protein Concentrate, Whey Protein Isolate), Cocoa Processed with Alkali, Xanthan Gum, Natural and Artificial Flavor, Cookie Pieces [Enriched Flour (wheat flour, niacin, reduced iron, thiamine mononitrate [vitamin B1], riboflavin [vitamin B2], folic acid), Sugar, High Oleic Canola Oil and/or Soybean Oil, Cocoa (processed with alkali), High Fructose Corn Syrup, Leavening (baking soda and/or calcium phosphate), Salt, Soy Lecithin (emulsifier), Chocolate, Vanillin - an artificial flavor], and Sucralose. Allergen Warning: Contains Milk and Soy. Produced in a facility that utilizes Milk, Soy, Eggs, Shellfish, Peanuts, Tree Nuts, Wheat. Keep out of reach of children. Notice: Do not use as a sole source of nutrition. Store in a cool, dry place. As a dietary supplement, use 1 level scoop with 8 oz of water, milk, or your favorite beverage in a shaker or blender. Allergen Warning: Contains Milk and Soy. Produced in a facility that may produce Egg, Milk, Fish, Shellfish, Soy, Tree Nuts, Wheat. Keep Out of Reach of Children.Notice: Do not use as a sole source of nutrition. INGREDIENTS:OPTIMAL BIOLOGICAL VALUE WHEY PROTEIN MATRIX (WHEY PROTEIN CONCENTRATE, WHEY PROTEIN ISOLATE), COCOA POWDER, XANTHAN GUM, NATURAL AND ARTIFICIAL FLAVOR, SALT, COOKIE PIECES AND SUCRALOSE. Depending upon your individual protein needs, mix 1-3 scoops of Machine Whey into 6-18 ounces of cold water or milk (6 oz per scoop) in a shaker or blender. CONTAINS MILK AND SOY. PRODUCED IN A FACILITY THAT MAY PRODUCE EGG, FISH, MILK, PEANUT, SHELLFISH, SOY, TREE NUTS, WHEAT. KEEP OUT OF REACH OF CHILDREN. INGREDIENTS:Optimal Biological Value Whey Protein Matrix (Whey Protein Concentrate, Whey Protein Isolate), Cocoa Powder, Xanthan Gum, partially defatted peanut flour, Natural and Artificial Flavor, Natural Mint Flavor, Cookie Pieces [Enriched Flour (wheat flour, niacin, reduced iron, thiamin mononitrate [vitamin B1], roboflavin [vitamin B12], folic acid), Sugar, High Oleic Canola Oil and/or Soybean Oil, Cocoa (processed with alkali), High Fructose Corn Syrup,Leavening (baking soda and/or calcium phosphate), Salt, Soy Lecithin (emulsifier), Chocolate, Vanillin - and artificial flavor], and Sucralose. Produced in facility that may produce Egg, Fish, Milk, Shellfish, Tree Nuts, Wheat, Soy. Contains Milk and Soy Notice: Do not use as a sole source of nutrition. Keep Out of Reach of Children. INGREDIENTS:Optimal Biological Value Whey Protein Matrix (Whey Protein Concentrate, Whey Protein Isolate), Natural and Artificial Flavor, Xanthan Gum, Salt, Soy or Sunflower Lecithin ,Sucralose, Acesulfame Potassium. Allergen Warning: Contains Milk and Soy Lecithin. Produced in a facility that utilizes Milk, Soy, Eggs, Tree Nuts. Keep out of reach of children. INGREDIENTS:Cold Processed Whey Protein Concentrate, Whey Protein Isolate, Non GMO Cookie Crumbs [Enriched Flour (Wheat flour, niacin, reduced iron, thiamine mononitrate, riboflavin, folic acid,), Sugar, Canola Oil, Cocoa processed with alkali, Salt, Sodium Bicarbonate], Chocolate Chips (Sugar, Chocolate Liquor, Cocoa Butter, Soy Lecithin, and Vanilla), Cocoa Powder, Natural & Artificial Flavors, xanthan gum, Sucralose and Sodium Chloride. Depending on your individual protein needs, mix 1-3 scoops of Machine Whey into 6-18 ounces of cold water or milk (6oz per scoop) in a shaker or blender. INGREDIENTS:Whey Protein Blend (Whey Protein Concentrate, whey protein isolate), Cocoa processed with alkali, Xanthan Gum, Natural and Artificial flavors, soy and/or Sunflower Lecithin, Salt, Sucralose, Acesulfame Potassium. Allergen Warning: Contains Milk and Soy. Produced in a facility that may produce Milk, Fish, Peanut, Shellfish, Soy, Tree Nuts, Wheat. Keep out of reach of children.Do not use as a sole source of nutrition. Contains Milk and Soy. Produced in a facility that may produce Egg, Fish, Milk, Peanut, Shellfish, Soy, Tree Nuts, Wheat. Do not use as a sole source of nutrition. Keep out of reach of children. INGREDIENTS: Optimal Biological Value Whey Protein Matrix (Whey Protein Concentrate, Whey Protein Isolate), Cocoa Powder, Xanthan Gum, Natural and Artificial Chocolate Flavor, Natural Mint Flavor, Cookie Pieces [Enriched Flour (wheat flour, niacin, reduced iron, thiamin mononitrate [vitamin B1], roboflavin [vitamin B12], folic acid), Sugar, High Oleic Canola Oil and/or Soybean Oil, Cocoa (processed with alkali), High Fructose Corn Syrup, Leavening (baking soda and/or calcium phosphate), Salt, Soy Lecithin (emulsifier), Chocolate, Vanillin - and artificial flavor], and Sucralose. INGREDIENTS:Optimal Biological Value Whey Protein Matrix (Whey Protein Concentrate, Whey Protein Isolate), Cocoa Powder, Xanthan Gum, partially defatted peanut flour, Natural and Artificial Flavor, Cookie Pieces [Enriched Flour (wheat flour, niacin, reduced iron, thiamin mononitrate [vitamin B1], roboflavin [vitamin B12], folic acid), Sugar, High Oleic Canola Oil and/or Soybean Oil, Cocoa (processed with alkali), High Fructose Corn Syrup,Leavening (baking soda and/or calcium phosphate), Salt, Soy Lecithin (emulsifier), Chocolate, Vanillin - and artificial flavor], and Sucralose. Allergen Warning: Contains Milk and Soy. Produced in a facility that may produce Eggs, Milk, Soy, Fish, Peanut, Shellfish, Tree Nuts, Wheat. Notice: Do not use as a sole source of nutrition. Keep out of reach of children. Allergen Warning: Contains Milk and Soy. Produced in a facility that may produce Egg, Fish, Milk, Soy, Shellfish, Tree Nuts, Wheat, Keep Out of Reach of Children. INGREDIENTS:Optimal Biological Value Whey Protein Matrix (Whey Protein Concentrate, Whey Protein Isolate), Natural Flavors, Xanthan Gum, and Sucralose. INGREDIENTS:Cold Processed Whey Protein Concentrate, Whey Protein Isolate, Graham Crumbs [Enriched Flour (Wheat Flour, Niacin, Reduced Iron, Thiamin Mononitrate [Vitamin B1], Riboflavin [Vitamin B2], Folic Acid),Whole Wheat/Graham Flour, Sugar, Soybean and/or Palm Oils, Molasses, High Fructose Corn Syrup, Salt, Sodium Bicarbonate], Natural Flavors, Xanthan Gum, Beta Carotene and Sucralose. Contains Milk, Wheat and Soy (Lechtin) Produced in a facility that may produce Egg, Milk, Fish, Treenuts, Shellfish, Soy, Peaunut, Wheat. Notice: Do not use as a sole source of nutrition. Keep out of reach of children. Store in a cool, dry place. INGREDIENTS:O[timal Biological Value Whey Protein Matrix(Whey Protein Concentrate, Whey Protein Isolate), Natural and Artifical flavor, Potassium Chloride, Sodium Chloride, Citric Acid, Sucralose. O[timal Biological Value Whey Protein Matrix(Whey Protein Concentrate, Whey Protein Isolate), Natural and Artifical flavor, Potassium Chloride, Sodium Chloride, Citric Acid, Sucralose. Contains Milk and Soy: Produced in a facility that may produce Egg, Fish, Milk, Peanut, Shellfish, Soy, Tree Nuts, and Wheat. Mix 1 packet of Machine Whey into 6 ounces of cold water or millk in a shaker or blender. CONTAINS MILK AND SOYPRODUCED IN A FACILITY THAT MAY PRODUCE EGG, FISH, MILK, PEANUT, SHELLFISH, SOY, TREE NUTS, WHEAT. INGREDIENTS:Optimal Biological Value Whey Protein Matrix (Whey ProteinConcentrate, Whey Protein Isolate, Cocoa Powder, Xanthan Gum, partially defatted peanut flour, Natural and Artificial Flavor, Cookie Pieces (Enriched Flour (wheat flour, niacin, reduced iron, thiamine, mononitrate (vitamin B1) roboflavin (vitamin B12), folic acid), Sugar, High Oleic Canola Oil, Cocoa (processed with alkali), High Fructose Corn Syrup, Leavening (baking soda and/or calcium phosphate), Salt, Soy Lcithin (emulsifier), Chocolate, Vanillin - and artificial flavor), and Sucralose. Mix 1 packet of Machine Whey into 6 ounces of cold water or milk in a shaker or blender. Contains Milk and Soy: Produced in a facility that may produce Egg, Fish, Milk, Peanut, Shellfish, Soy,Tree Nuts, and Wheat. INGREDIENTS:Optimal Biological Value Whey Protein Matrix (Whey Protein Concentrate, Whey Protein Isolate), Cocoa Powder, Xanthan Gum, Natural Cream Flavor and Artificial Chocolate Flavor, Cake Bits (Enriched Flour (wheat flour, niacin, reduced iron, thiamin mononitrate [vitamin B1], roboflavin [vitamin B12], folic acid), Sugar, High Oleic Canola Oil and/or Soybean Oil, Cocoa (processed with alkali), High Fructose COrn Syrup, Leavening (baking soda and/or calcium phosphate), Salt, Soy Lecithin (emulsifier), Chocolate, Vanillin - and artificial flavor], Sucralose, Red #40. Produced in a facility that may produce Egg, Fish, Milk, Peanut, Shellfish, Soy, Tree Nuts, and Wheat.